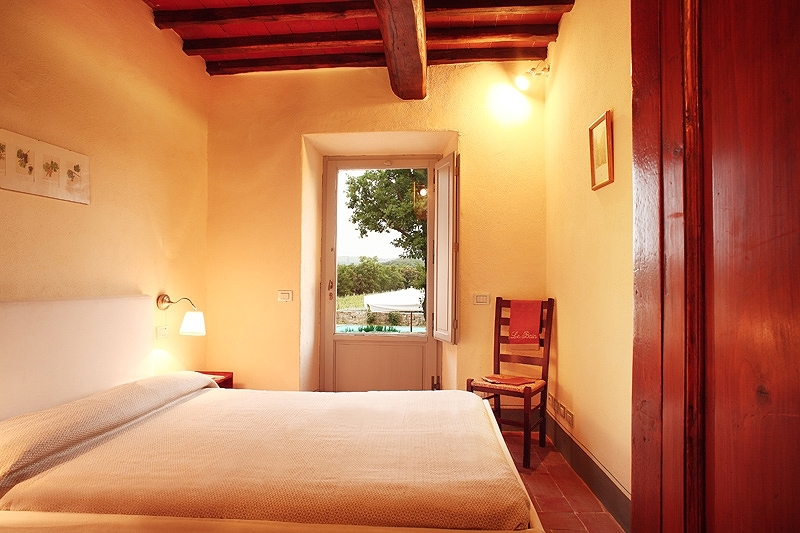 Three apartments in a gracious farmhouse a few kilometres from Montalcino. 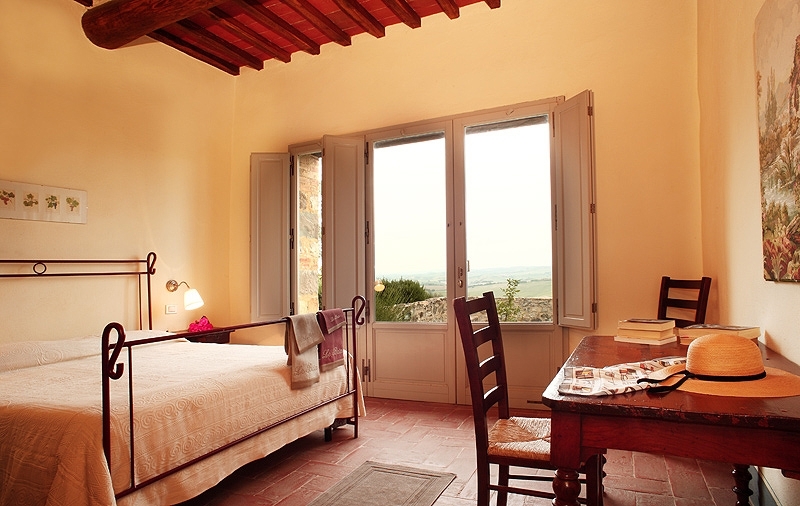 Situated in the Val d’Orcia in a panoramic position, it enjoys lovely views of the surrounding countryside. 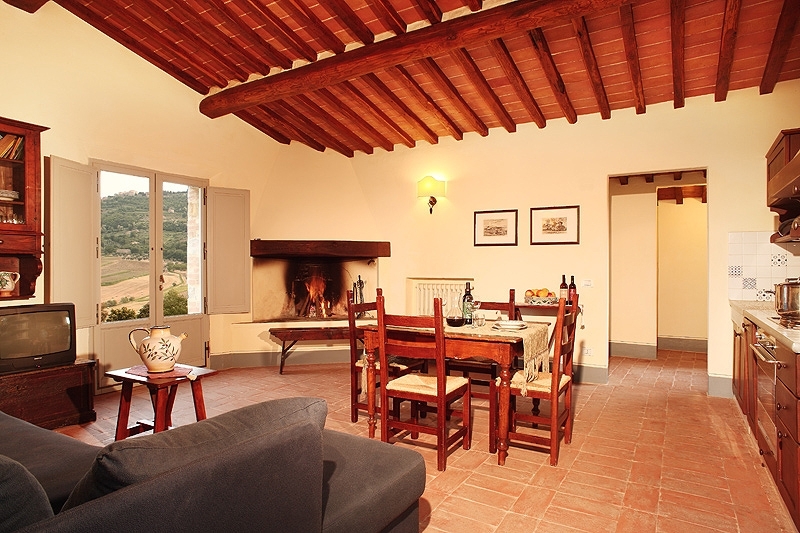 The property is owned by a noted producer of Brunello and has recently been renovated maintaining its original character. Well furnished with care in rustic style. Each apartment has a security alarm and a hairdryer in the main bathroom. Central heating. Arrival on Saturdays by 6.30p.m.Final cleaning included in the rental price. Distances: Montalcino with all types of shops, banks, post office, pharmacy and restaurants 4km, Pienza 20km, Siena 38km, Vagliagli with ABV headquarters 49km, Montepulciano 50km, Grosseto 55km. At guests' disposal: pleasant garden with lovely terrace in panoramic position with swimming pool (5m x 14.50m, depth 1.60m, open 01/05 - 30/09, cold water outdoor shower), changing room and bathroom with shower (hot water), wood burning oven, laundry (no fee), baby bed (€70.00/week), extra-bed for kids up to 11 years (€105.00/week), parking on premises. - Ground floor: living room with fireplace, satellite TV, kitchen area (oven, dishwasher, freezing compartment), dining area and access to private garden with splendid views of Montalcino, small storage area and access to private terrace that faces the swimming pool, one double bedroom with private bathroom with tub (window), a few stairs lead to a small single bedroom with large single bed (130cm) with access to private terrace, bathroom with tub (hairdryer, window).